Unlike several of the other reviewers, I do not have a Western heritage. I am a born and bred New Yorker. I found Every Soul is Free to be a great read even though I am unfamiliar with the lifestyles and landscapes it depicts. The themes of family, career, and the choices we are forced to make are universal. Mr. Massey is obviously observant and introspective as his characters are real people with imperfect lives. At the end of the novel, as in life, questions are left unanswered. How the sheriff’s family and coworkers will fare without him is unclear. Mr. Massey is a skilled storyteller. The novel fluidly moves between generations while nimbly moving the story forward. I look forward to reading Telluride Promise. This is a novel about storytelling. As Simms’ posse travels to find an escaped prisoner, the men tell stories to each other about the pioneers who first inhabited the area east of Salt Lake City and their descendants. There are legends about courage, mistakes, valor and loss. Tales about resilience and sacrifice, egotism, love and generosity. The characters in this book do not talk about how they feel or what they think; they are a stoic people, short on words, until it comes to telling stories. It is through their stories that they speak to us. The stories in this book are quite functional. Many are used to pass on things learned from the past. Others are told between men to distract, to weather difficulty or prepare for instantaneous decision making. Stories are used to define families and to contrast the older generation with the newer one. Indeed, it would be fair to say The Story is the main character in this book. Harding rocked in his stirrups. He wanted to ask a question. This novel is for the reader who is fascinated by the history of the West and by the way past generations spoke and lived. The plot is linear, and devoid of complexity. The complexity in this book lies in the colorful array of stories told along the way and the messages they carry. Edward Massey’s exciting and moving book centers on Sheriff Mark Willford Simms — a complex and sometimes exasperating man driven by duty, sometimes to the painful exclusion of those he loved, and the layers of family and broader history that made this flawed but good person. Mr. Massey put it well when he said his writing “explores the struggles people encounter in staying true to themselves and their ideals.” In the process, he leads his readers on great adventures. In many ways, Simms seems a man of the 19th Century, even as he does his job in 1948, when the central, thrilling action takes place. The escaped convict whom he pursues into the high mountains is also a complicated man, and linked by personal history to Sheriff Simms. Edward Massey avoids stick figures. Edward Massey is a gifted author who depicts the American West in an authentic and gripping way. The perseverance and integrity of the human spirit is most evident in this superb story that I didn’t want to end. Although I live in the West, the descriptions of early pioneer life were most interesting and informative. I hope there is a sequel. Mr. Massey has crafted a story that pulls the reader in from the earliest pages. Sheriff Simms provides the prism through which the reader sees western life in the late 19th and early 20th century. Through the story the reader feels acutely the trials that such a setting can put the sternest of people through. Sheriff Simms is guided by the simplest of personal philosophies, meet life head on and stand on your on two feet. While simple to describe, as the story unfolds, the reader learns just how difficult it is to adhere to that philosophy. Sheriff Simms’ life is brought full circle by manhunt and posse that drives this narrative. Through it all we learn about the importance of personal character and being true to yourself. Sheriff Simms is a very good man, dedicated to doing what is right. It is his duty. In this regard he is very much like C.C. Wain, the protagonist in Edward Massey’s first novel, “Telluride Promise”. Both stories are set in the West, where tradition dictates that there is moral clarity. Yet Sheriff Simms is given multiple opportunities to shirk his duty. Recapturing this escaped convict is dangerous business and he has an obligation to his young grandson. Also, his own health is failing. What’s more, others were responsible for the convicts escape. Shouldn’t they be responsible for his recapture? What sets Sheriff Simms apart is that he spends zero energy trying to justify not doing his duty. The right thing to do is clear to him, as ultimately it is clear to all of us. Edward Massey can write. Some of his descriptive passages read like poetry. The pursuit through a blizzard becomes a pilgrimage. The ending is satisfying if not happy. The characters are all extremely well developed. Since this book is billed as “The High Mountain Sheriff’s Series” there will almost certainly be sequels. I for one am anxious to learn what happens next to these now familiar folks. Great book by a great author. I loved this book! What a great story. The author brings you into a world from days gone by with such ease and finesse to detail it was almost as if I was there. Truly a great writing talent. I highly recommend this book if you are seeking an adventure and drama. WOW, what an adventure and how truly true to life written. I could just see all of this taking place and loving all the humor and emotion and sure hope I here more from Mr. Massey . He writes with such clarity and expression that if you do not enjoy reading it that is your fault. Two Remington Western prints hung in my bedroom as a kid. Always fascinated me. Spent countless hours reading about the history of the West, its heroes, bandits, treks, and pioneers, and still more hours reading the novels of L’Amour and Grey, McCarthy and McMurtry. Fell in love with the West’s geography, its “wide open spaces”, the miles with just plain nothing but the land, the heroes, who brought the bad guys to justice. Visiting the West as an adult, I found my fascination well-justified. Recently I had the chance to update my affair with the West in Edward Massey’s Every Soul is Free. Everything that ever attracted me to the West was there. The reliable, steadfast, true to his principles lawman, the open spaces, the selflessness, the pioneering families and spirit which survived into the 20th century, and the willingness to take risks for the good of the community. It was all there and a great read. How far does duty drive a man? Sheriff Simms must find out in this second novel by Edward Massey. He must choose between his love for a man he raised as a son and the traditions and Simm’s heritage as the third generation of law men in his family. Set in the high mountain country of Utah and Wyoming against the background of almost 80 years of Mormon settlement, Massey skillfully weaves in vignettes illustrating the history and unique societal issues driving this community. As a semi-professional historian, I must admit that I learned as much or more from this excellent novel than all the specialist books on the subject I have read over the years. All this and a riveting story thrown in as a bonus! These elements are skillfully woven into Massey’s narrative without breaking its flow. By the middle of the book, I feel that I know every character and why they behave the way they do. The “foster” son has in fact committed a grievous crime in Wyoming, for which he has been jailed by Simms. The plot unfolds when an incompetent group of Wyoming deputies take custody to bring him from the small Utah mountain town back to Wyoming to stand trial. The story unfolds from the miscreant’s initial escape, through to his final apprehension. Sheriff Simms believes that it is his duty to constitute a posse to recapture the escapee. This process unfolds against the background of Thanksgiving weekend, which further complicates matters. For example, this interrupts important family matters as Sheriff Simms tries to pass on the essentials of what it means to be a man to his 6-year old grandson, who is being bullied by an older boy. One item that the author does not explain is why the armed Wyoming deputies do not track the unarmed escapee who is fleeing on foot through fairly deep snow. One would assume that an obvious trail would be created. All the deputies do is tell Simms of the escape and then return to Wyoming. Never underestimate the drawing power of Thanksgiving Turkey! When Simms and his posse take up the chase, the escapee has a substantial head start. But Sheriff Simms is convinced that he knows where their quarry is headed. He does not explain his reasoning to the posse, which leads to the grumbling one would expect. The interception effort involves travel by truck, horseback as the posse moves farther into the mountains and finally on foot through the snow towards where Simms expects to find his quarry. The conclusion is swift and startling. All in all, Massey has created a fascinating yarn, one that is well worth reading. I admit I read very few books, but I recently received a copy of Every Soul is Free as a birthday gift. I thought what the heck, I’m due to read a book. I’m glad I did because it took me back to my roots, and reminded me what is really important in this life. Sheriff Simms reminded me of my dad, who was a simple, honest, hard working man who showed his loving compassionate side by his actions, not words. Thank you for reminding me of my life growing up in a small town in the mountains, but most of all what a good man my father was. I have never reviewed a book before so I am not certain of what to write. This book brings back the days when integrity and values were important. Money was not the driving factor and family and friends were important. The descriptions of the mountains, the snow, the wind, etc. almost made me cold! I could picture exactly where they were, and I have never been in that area of the country. Also the history that was blended in was interesting. A great story teller. Much more than a very well written story about a manhunt in a snowstorm. The reader gets to know the characters as individuals, each of whom provides a vantage point from which to consider the underlying theme: to what extent is a person really free to choose his (her) life and what he’ll be? The question reverberates after the story ends. This well constructed story builds slowly, moving back and forth between three generations of Simms sheriffs as a colossal snow storm gathers force culminating in a final showdown, fulfilling the destinies of Sheriff Simms and the fugitive he needs to pursue. Curl up and enjoy this great read in front of a warm fire, the chilling 11,000 foot trek up the mountain to catch a killer will have your teeth chattering. This is a wonderful story of the chase into the snow covered Western uplands of a once favored and clever boy who is now a hardened grown man, murderer and fugitive. When the boy was young, the sheriff acted as a defacto step farther and mentor to him. Despite the sheriff’s stern love and good example, the boy turned mean. Now the sheriff, old and ailing, must leave his Thanksgiving dinner table surrounded by three generations of his family, put on his winter coat, kiss his worried wife good bye and head into the mountains where a younger and stronger man awaits him. I will not reveal the final scene between the sheriff and the fugitive. You will find it dramatic and captivating. The chase is set in the high Rockies and in the Mormon community in the valley below where the sheriff and his father and grandfather have been protecting the people for three generations. The interweaving of geography, modern rural Mormon life and Mormon history gives the chase context and meaning. It is hard to imagine this kind of chase and this kind of people in a different setting. For example, the depiction of what may be called old fashioned values and restrained and undemonstrative but responsible personal relations, so unfashionable today, is very well done and gives a uniqueness and reality to the story. I very much enjoyed this book, and I strongly related to it as my ancestors also traveled across the plains. Massey has a strong command of language, painting vivid pictures when describing the scenery and setting. Massey built the tension adroitly by shifting back and forth from the posse to historical context / events. By the end, it was nail-biting time. Did Simms get Hixson with his shots or did the deputies come in with the wind? Or was that the avalanche? I would like to know what happened to the deputies. The ending with Butch was effective: the inherent tension and disparity between the job and family and the results of things left undone. Simms, the main character, was fully drawn as he had both strengths and weaknesses. The lesser characters were also well-rounded. The folk wisdom and philosophy were well-done, but would have still worked with a little less. Kudos. Keep moving forward with the series. It’s a darn good read! I just finished reading Every Soul is Free and I miss Sheriff Simms already. It was a privilege to journey with a man grounded in his truth. A man who embraces the life he was born into and the responsibilities he chose to accept. He knows who he is, he knows his duty, and he fulfills it without complaint. How refreshing! Sheriff Simms was a man of his time and place. Edward Massy is a gifted storyteller who brings that time and place in the American West to life. The men and women whose lives are interwoven in it’s fabric are well crafted as they play out the hands they are dealt. Pick up the book, meet Sheriff Simms, and enter a world both genuine and rare. It’s a darn good read! It has been quite a while since I picked up a book and did not want to put it down. It was only my aging eyes and brain that finally succumbed to sleep; otherwise, I may have read until the morning as I used to do, to finish this one. Ed Massey has crafted a tale — a real-life-type tale. Because I am so familiar with the where of this novel, it was easy to relate to the various settings. To me, the accurate description of the places in which the book is set, immediately reveals the artistic and historic integrity of the author, and the story, then, is off and running, literally! The sheriff in the story is so like my own father in his quiet, introspective manner; I sometimes chuckled, and sometimes had to stop and wonder if he was reading over my shoulder. The storyline is predictable to some extent, but is so enriched by the accompanying characters and experiences that it is skillfully fleshed-out with a wealth of pertinent parallel tales. I see by the description that the book is listed for youth. That is great and I agree — but I highly recommend it for adults, especially for those of us who are either nearing or are firmly ensconced in the retirement years. It is well-written, leaves a question or two to keep our attention, and should not be the last book written by this author. He writes with restraint and insight, and lays a rich foundation for story. What fun to find another author in the mode of writing that appeals to me. Every Soul is Free takes place in Utah on Thanksgiving 1948. The characters are of that era and the contrast with the society of 2014 could not be more compelling. This is a lovely reminder of an earlier era and the truths we would hope to teach our grandchildren. This is a thoughtful book, as evidenced in the title. 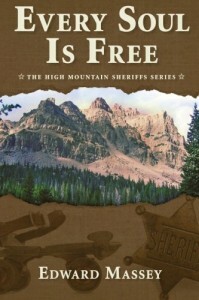 Every Soul Is Free tells the story of a posse’s manhunt for an escaped prisoner in the Uintah Mountains on the Utah/Wyoming border in the late 1940s. The protagonist, Sheriff Simms, is a third generation lawman who embodies the independent and pioneer spirit of the West. A strong, self-reliant, decent man who has spent his life doing the right thing, the Sheriff is more than just a lawman; he is a teacher of men. Yet his dedication to his job and his duty has been a source of suffering for his wife and has kept his own children from internalizing the values he teaches and lives. Even more difficult is the fact that the escaped prisoner is a man whom he raised as a son and whose family’s history is closely entwined with his own. The author uses the posse’s trek through the mountains to recount the trials and tribulations of the original Mormon pioneer settlers of the area and the Sheriff’s eventual confrontation with his own successes and failures and, finally, with the escapee and his own past. As in his earlier work, Telluride Promise, which touches on similar themes of frontier justice and independence, Mr. Massey provides wonderful descriptions of the hard men and women and the trying conditions they endured in settling the American West. All in all, a superb depiction of pioneer lives and values and a well written, informative, intriguing, and exciting read. I congratulate Ed Massey on a fine piece of historic story telling. Many readers born as I was in the West, will have personal memory of the places, dinner tables, towns and forests he writes about. We all knew people from our own childhood just like his principle characters, both the good ones and the not so good ones. (not our families, perhaps, but people we knew of). It is easy to imagine being part of every scene. The reader will love the authentic language and the depiction of simple people living inevitably hard, but not necessarily tragic lives. Those folks had their deeply held societal rules, moral codes, personal values and their humanity; Massey’s book makes a case that their solid world-view came more from a true-grit pioneering spirit than exhortations from the religious leaders of the day. Those earliest settlers created a social system based on survival, generating an ordered structure of respect, authority and responsibility that survived generations. Regrettably, only few of those that descended into our generation have re-discovered, remembered or chosen to live by this pioneer coda, or value enough its part in our heritage. All those with a Western heritage will enjoy Every Soul is Free.